The salad ends up being fine. I mean, it suits its purpose in the sense that it makes me less hungry. Honestly, it usually ends up being a C- salad, with too much balsamic vinegar that stings my taste buds and essentially masks the flavor of every other ingredient. Which doesn’t make me very happy. You know what does make me happy? A pretty salad with a well-balanced, zesty vinaigrette. I usually end up wishing that I had taken a bit more time preparing a meal that is as appealing to the eye as it is to the palate. I think I at least owe that to myself, right? Right. 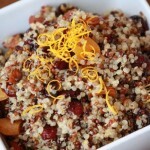 The result is a vibrantly-colored, healthy salad that would be a lovely al fresco lunch and dinner entree or a popular side dish for your next picnic or barbecue. I ate it for lunch and dinner the day that I made it. So, technically, this salad was so delicious that it actually ended up saving me prep time in the long run. That means it’s a keeper. 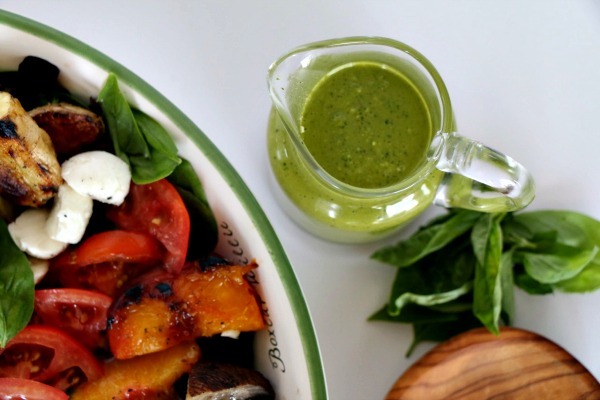 Do yourself a favor and make this pretty, delicious salad and addictive pesto vinaigrette. I promise, you’ll be happy you did. 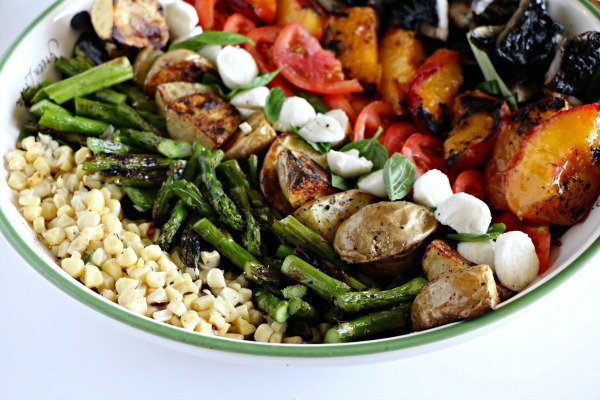 This summery salad is twist on the traditional Cobb, incorporating grilled vegetables such as sweet corn, asparagus and potatoes, juicy grilled peaches, fresh mozzarella and a lemony pesto vinaigrette. 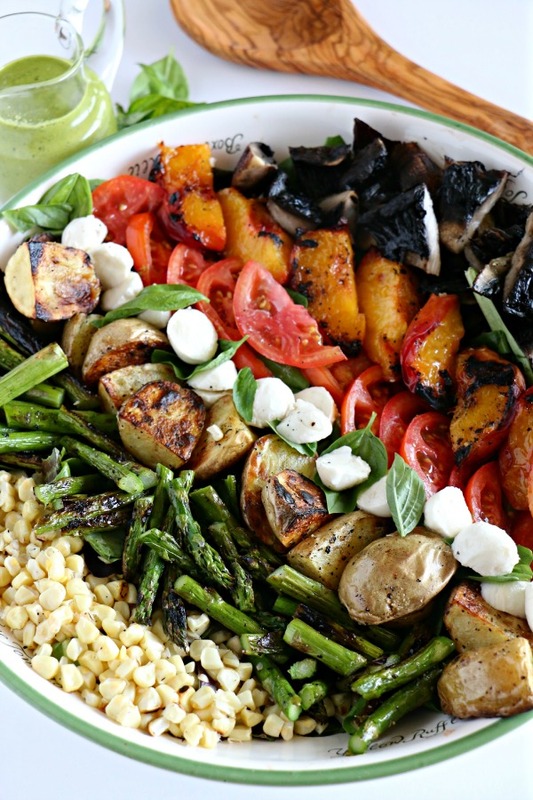 The beautiful presentation makes it a great healthy option for entertaining or for a vegetarian supper. Make the vinaigrette: Place the basil in the work bowl of a food processor. Add the garlic and pulse enough times to roughly chop. With the motor running, add the olive oil in a steady stream down the feed tube, stopping to scrape down the sides of the bowl if necessary. Add the pine nuts, parmesan, salt, and pepper and puree, until well blended and smooth. Add the vinegar and lemon juice and blend until smooth. If necessary, add water, 1 tablespoon at a time, until the vinaigrette has reached your desired consistency. Cover and chill until ready to use. Heat a gas or charcoal grill over medium-hot heat. On a large sheet tray, toss the asparagus. potatoes. corn and mushrooms with olive oil and season with salt and pepper. Brush the cut sides of the peaches with olive oil. Using a flat grill pan or a professional grill pan (something that keeps small pieces from falling through the grill grates), grill the asparagus and potatoes until they are lightly charred and tender. The asparagus will take much less time than the potatoes, so remove them to a foil-line sheet pan when they are done. 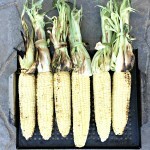 Grill the corn directly on the grill grates, turning occasionally, until the kernels are lightly charred and tender. Grill the portobello mushrooms, turning once, until the juices start to release and the surfaces are lightly charred and very tender. 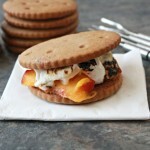 Grill the peaches, cut sides down, just until there are light grill marks on the surfaces and they are warmed through, 3-4 minutes. Using a serrated knife, cut the corn kernels from the corn. 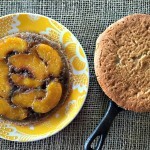 Cut the peaches into thick wedges, and thinly slice the portobello mushrooms. Cut the asparagus into 1-2 inch pieces. 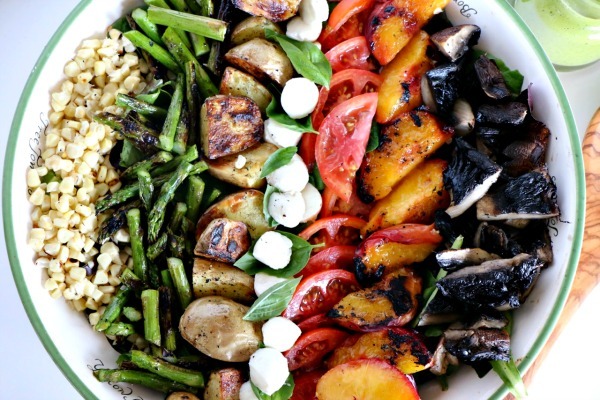 Assemble the salad: Fill the bottom of a large serving bowl with the mixed greens. 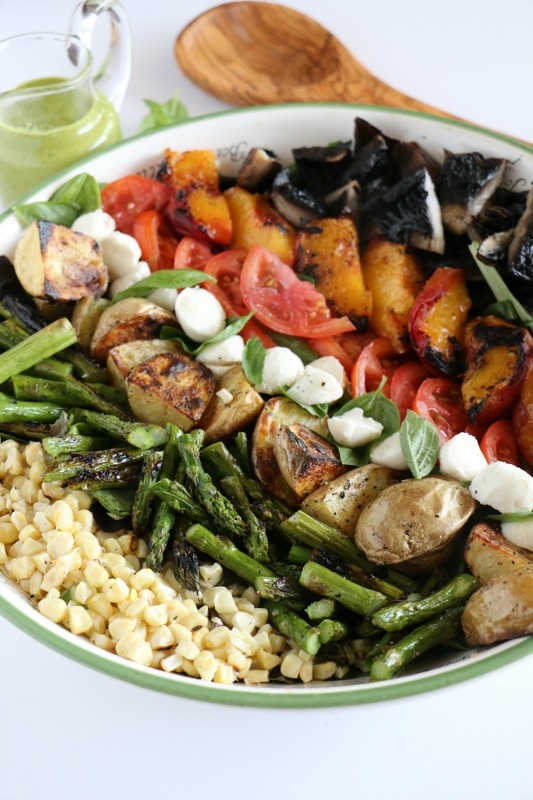 Working in rows, arrange the corn, asparagus, potatoes, mozzarella, tomatoes, peaches and mushrooms across the top of the greens. Sprinkle the basil leaves on top. Serve the salad, passing the vinaigrette on the side. Great salad! I do the lazy way often…lol. Then too much vinegar. Will have to give this vinaigrette a try! Thanks so much, Lisa! Then you know what I was talking about. Don’t you hate that? It always burns my taste buds and covers up the flavor of the salad. I hope you love the vinaigrette as much as we did!